To get t' Foo Island ya gots to have a map. To find the map, follow the skull and cross bones ... and watch your back! Remember to bring your own bed linens, our below decks slave hasn't been around in months... all we've got are a few winding sheets leftover from the last burial at sea. For more instructions, contact Cap'n Steve, if you can find him. He might be hiding out at 705-366-5661. Plans for Foo Island 2008 are being plotted now, so get your calendar squared away for Aug. 8-10 weekend. Ann-Marie is gathering up the menu slaves and preparing a duty roster. For infomation, contact Cap'n Steve at his new e-mail address, which is at the left. 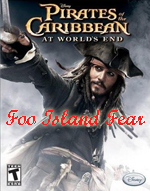 Be sure to buy your copy of the latest Foo Island Official video game, "Foo Island Fear" where you control how many beers Cap'n Steve consumes and how many times Lady Barb says, "awww, Steve...."